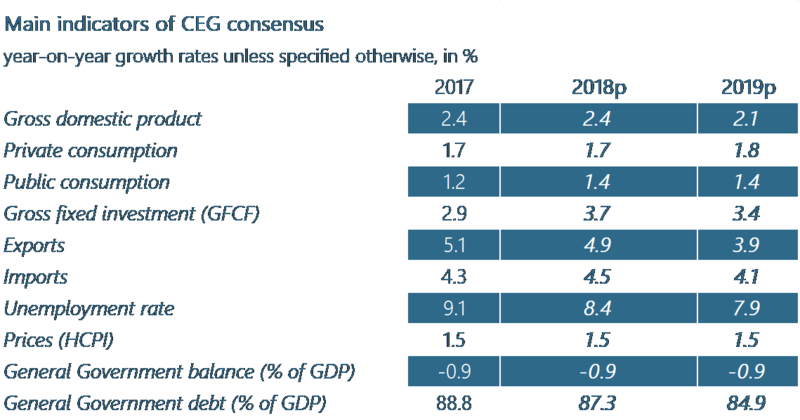 The chief economists’ group of the European Banking Federation expects economic growth in the Euro area to continue growing at a steady pace this year. The 19-country block will continue benefiting from supportive financial conditions, sustained global and domestic demand, and robust growth of global economy. While political uncertainty in Europe is less of a threat than in previous years, geopolitical tensions and escalation of a possible trade conflict remain downside risks. We expect the Euro area to expand, above potential, by 2.4 percent in 2018. The growth is expected to slacken slightly in 2019, when we foresee a GDP expansion of 2.1 percent. The Euro area economic growth will expand at a steady pace. We foresee the Euro area GDP growing by 2.4 percent in 2018 and by 2.1 percent in 2019. European banks see inflation stable. We expect consumer prices to increase by 5 percent annually over the coming years. Public finances will continue to improve. The Euro area’s general government budget deficit will be 9 percent of GDP in 2018 and 2019, down from 1.5 percent in 2016. Labour markets will continue to improve over the forecast horizon consolidating the economic recovery phase. The jobless rate is forecast to be 8.4 percent in 2018 with a further improvement to 7.9 percent in 2019. The CEG’s consensus remains surrounded by a number of both upside and downside risks. Solid growth of the world economy allowing the Euro area to continue growing above potential and making the 19-country bloc more resilient to external shocks. Expectations for higher private consumption, good pace of growth for public consumption and the fixed gross capital formation. Also, stronger economic momentum leading to higher investments. An even longer period than currently expected with extremely lenient monetary conditions. Although the uncertainty related to the political events in Europe has diminished, geopolitical tensions have the potential to spark a period of instability disturbing buoyant global growth. Trade tensions between the US and China may trigger a trade battle that would harm the recovery of the global economy. The Euro area, that is relatively highly exposed to external trade, would be severely hit if EU-US trade frictions start and US tariffs are imposed on EU sectors. Although negotiations between the European Union and the United Kingdom seem to be progressing in the right direction with the conclusion of the first stage of negotiations, the final outcome and next stage i.e. trade negotiations, remain a major concern. Sudden increase in inflation leading to sooner than expected tightening of monetary policy. The risks to the growth outlook are fairly balanced, according to the Chief Economists’ Group.